I have the intakes on and using my favorite intake adjuster (Milliput putty) there has been some progress on the kit. Note that the fuselage seams have been smoothed and hit with a coat of Mr. Surfacer to check for seams issues. Starting to look like a spook! Next stop back to the cockpit for some instrument wiring and canopy fitting. Hope your modeling days are fruitful! I got the cockpit coaming on the F-4. I have been amazed at how well a set for the Hasegawa kit fits on the Monogram F-4. Usually I have to cut fit repeat but this one went on very well. I checked the fit of the canopies against the installed cockpit and things are looking pretty good there too. The only issue you can see tonight is the paint applied to the coaming had the nerve to start coming off; that after I painted it dark gull gray, then checked my reference and repainted it engine black. I took a bit of thinner and a paper towel and carefully took much of the paint off. I will paint it as again as I finish the fuselage. 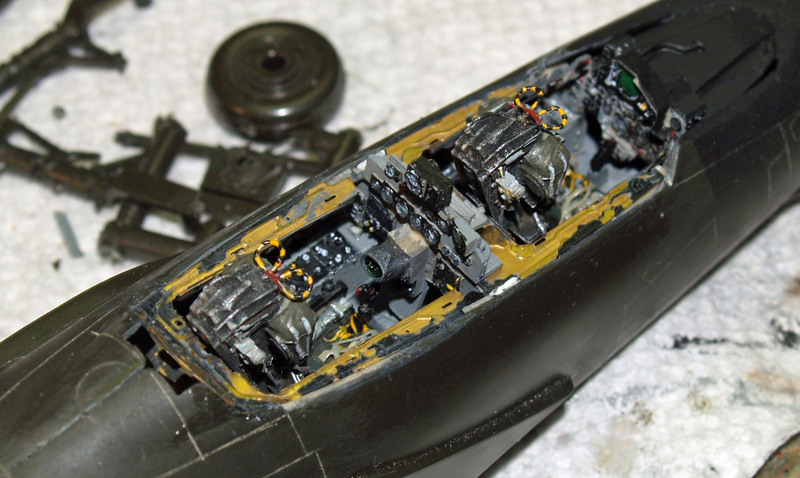 Next steps are to do some work on the fuselage seams. Other then a mismatch and gap on the built in tailhook, even the fuselage went together without any really big issues that need addressing. And since I rescribed this thing it should be easier to restore the panel lines after sanding the seams. Till then, keep the glue off your shoe. Last post I was working on the cockpit and today I succeeded in convincing the KMC cockpit for Hasegawa to fit into a monogram fuselage. It doesn’t look too bad. With me, almost every step in modeling is another opportunity to do something that you don’t realize will happen, and today was no exception. I thought, once I got it in, that I needed to put some extra super glue inside the fuselage to hold the cockpit better, so I lined up the really runny stuff and gave the bottle a squirt in the the recesses I thought would hold it. A few minutes later I observe what looked like smoke coming off the back of the plane. Now I know a Phantom was known as quite a smoker but I didn’t even have the engines in yet. icicle” I had to cut off the back of the model, no worse for wear or tear. Next stop finishing the cockpit top liner and the upper rear instrument panel wiring and attachment. Keep the glue off your shoe!